Pax Mongolia, which means Mongol Peace in Latin, is a historiographical term describing the stabilizing effects of the Mongol Empire in the vast Eurasian territory that the Mongols conquered in the 13th and 14th centuries AD. Pax Mongolia helped the development of commerce and communication in the region, especially along the Silk Road, and helped make possible the formation of closer ties between the Eastern world and the Western world. 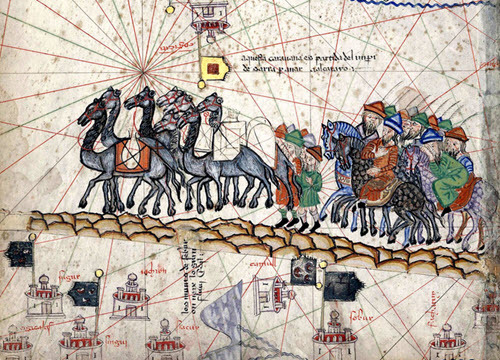 The Mongol Empire developed a reputation for fiercely guarding the Silk Road to ensure its usefulness for travelers. In contemporary sources, it is not usual to find (probably a tad hyperbole) claims of how “a maiden carrying a nugget of gold on her head could wander safely throughout the realm”. Eventually, the Mongol Empire was divided into four khanates – Yuan dynasty, Golden Horde, Chagatai Khanate, and Ilkhanate – but the Pax Mongolica remained until the disintegration of the khanates and the outbreak of the Black Plague in Asia; a disease which spread along the trade routes, including the Silk Road, and had far reaching social, economical and political effects for both Euroasia and northern Africa. Even before the rise of Genghis Khan, towns scattered along the Silk Road in Mongolia were actively involved in the trade that took place along its route, and this is supported by both archaeological evidence and written sources. When Genghis Khan eventually rose to power and began his conquests, control of the Silk Road trade – and dealing with certain trade disputes – were an essential part of the development. One of the sources where this becomes apparent is the chronicle of Mongol history written by ‘Ata-Malik Juvaini – himself not a Mongol – in the 1250s. The flourishing of the Silk Road under Mongolian rule was due to several factors, including Mongolian promotion of the route and the improvement of vital infrastructure that helped make the trips safer. The Mongolian khans were known to sometimes forcefully re-settling individuals along the Silk Road as they saw fit. The Franciscan monk Willem from Rubruck, who traveled on the Silk Road in the 1250s and visited the Mongol capital Karakorum, does for instance write about how he met a goldsmith named Guillaume Bouchier in the capital. Bouchier, a Paris native, had been kidnapped by Mongols at Belgrad and ended up in Karakorum. His wife, also French, had been kidnapped during the Mongol invasion of Hungary. Another travel writer, the famous Marco Polo, describes settlements consisting of whole colonies of weavers from the Middle East that had been forcefully moved to Mongolia and northern China by khans to satisfy Mongolian cravings for the type of luxurious Middle Eastern-style textiles that these weavers could produce. The European city-state Genoa benefited greatly from Pax Mongolica and from forming alliances with powerful Mongolian khans. The Genoese did for instance sign a treaty with certain khans that gave Genoa exclusive privileges in the Black Sea ports, and coins were issued that bore the inscription of the khan on one side and the seal of the Bank of St. George of Genoa on the other. In the late 13th century, Genoan traders purchased a port city on the Black Sea from the Golden Horde and established Kaffa, a flourishing trading settlement, there. Soon, they had more or less a monopoly on international trade in the Black Sea region and Kaffa became an administrative center for other Genoese settlements that developed around the shores of the Black Sea. Kaffa also became home to a very large slave market. In 1204-1261, and then again in 1296-1307, Kaffa was under the control of Genoa’s arch rival, the Republic of Venice – another city-state on the Italian peninsula. Muslim travel writer Ibn Battuta (b. 1304), who visited Kaffa while the city was in Genoese hands, writes about Kaffa being a great city and one of the world’s most celebrated ports, with a wonderful harbor in which Battuta personally saw roughly 200 vessels – both warships and trading vessels. 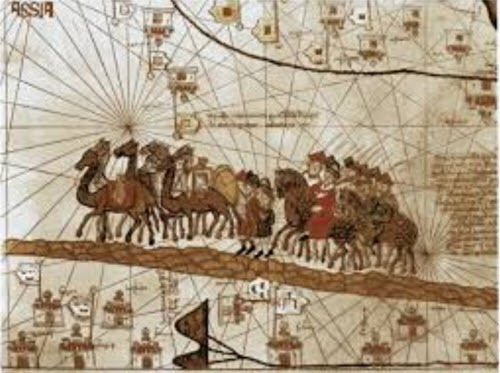 One of the reasons why the Golden Horde was so interested in maintaining an alliance with Genoa was that it helped them with their connection to their allies in Egypt, the Mamluks, since they could communicate with each other via Byzantinum. Yam was a postal relay system developed by the Mongols. When a khan needed to quickly transmitt a message of long distances, he could send it with a dispatcher who would carry a special badge of authority called a paidze. The paidze gave its carrier the right to many forms of aid within Mongol territory, such as the right to exchange tired riding animals for rested ones at the regularly placed relay stations. In his writings, Marco Polo emphasizes the great Mongolian leader Kublai Khan’s willingness to entertain “all the religions of the book” (i.e. Judaism, Christianity and Islam) while at the same time practicing the rituals rooted in a traditional Mongolian religion. 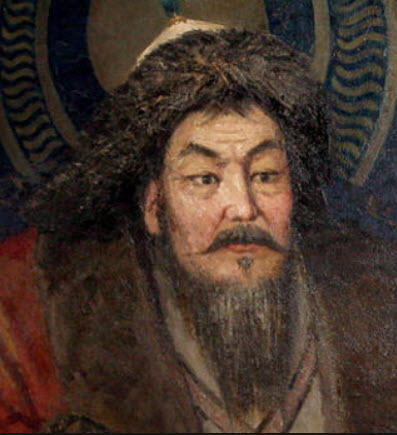 Kublai Khan also built a great observatory for himself, which he staffed with astrologers / astronomers of various origins, including Muslims from the Middle East. During Pax Mongolica, Nestorian Christianity went through a revival throughout Eurasia, while at the same time the well-kept Silk Road and its connection to trade routes coming up from India helped facilitate the spread of Tibetan Buddhism to China and in Mongolian lands. This is also a period in history when we can see the Islam faith spread, especially in Eastern Europe. Some Mongolian khans went through religious conversion, but the seem to have stayed clear of imposing conversion on their subjects. Their Russian subjects were for instance not forced to relinquish Christianity even when living under non-Christian khans, and the trade routes protected by the Mongols also helped Russian Christians to stay in touch with Christian centers located far to the west of Russia. Initially, the parts of Russia that were invaded and conquered by Mongols went through a period in the 1230s where the construction of masonry churches dropped sharply – something which historians have interpreted as a sign of bad times. By the end of the 1200s, there was a revival, and in the 1300s we can see a real building boom during the reign of the Mongols of the Golden Horde. One of the Russian cities that prospered under the Golden Horse was Novgorod, and the 14th century AD was also very beneficial for Moscow which goes from being a rather insignificant town on the River Volga to being a notable political and cultural center. During this era, the princes of Moscow had a very close and well-functioning relationship with the Mongol Khans. One area that suffered greatly under Mongol rule and did not recover from its initial devastation during the conquest was a part of Iran that flourished prior to the conquest thanks to a complex underground network of irrigation channels. The invading Mongols destroyed this network and it was not rebuilt again.